Talk about diversity! This punk muslimah is from Helsinki, Finland. 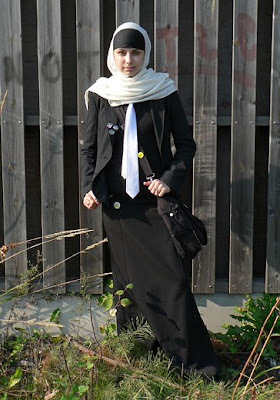 Get the look: black blazer, Dorothy Perkins; black jilbab, Simply Islam; white tie, Debenhams; white scarf, Muslimah Essentials; black underscarf, Muslim Base; silver rings, Dorothy Perkins; Converse, Office Shoes; black buckle bag, Peacocks. salams, i came across ur blog and am thankful for all de posts dat u've put up...i've been wanting to change my hijab style and wanting to wear de amira/shayla/cant rem de names...but dunno if i have de face shape for it...living in SIngapore and they dun sell this style here in Asia...shipping is too ex!! BUT ur blog has made me dream of lookin AWESOME in hijab agn! LOL---not me--I'm pretty pretty, but maybe if the hijab was a houdstooth patterned one---then the look would be Gwen Steffani. Maybe I could swing that. My little sister would love it though. Look forward to your shayla post. Not a bad look, I've seen lots of younger sisters in hijab affecting the gangsta look and the punkier look especially with the skull bandana's and hijabs. I think this one wouldn't be too bad without the tie, but not smart/luxe enough for me. I like the tie, gives the outfit personality and sleekness. love this look. i used to go about like this with that attitude when i was younger, lol.